July 23rd, 2013 – The Arizona School of Traditional Karate, home of Hall-of-Fame martial arts instructor, Soke Hausel, was selected for the 2013 Best of Mesa Award. The Arizona Hombu (world administrative headquarters) for Seiyo No Shorin-Ryu Karate Kobudo Kai was also selected. Each year, the Mesa Award Program identifies companies that are believed to have achieved exceptional success in their community. These exceptional companies help make the Mesa area a great place to live, work and play. The 2013 Mesa Award Program focuses on quality, not quantity. Winners are determined based on the information gathered both internally by the Mesa Award Program and data provided by third parties. The Arizona School of Traditional Karate was established in 2008 on the border of Mesa and Gilbert, Arizona and is operated by Grandmaster Hausel, 16 time Hall-of-Fame inductee and member of Juko Kai International and Seiyo Kai International. Soke Hausel previously operated martial arts programs at Golds Gym, ASU, University of New Mexico, University of Utah, and for 30+ years at the University of Wyoming. Unlike many “Self-Proclaimed” grandmasters in the West, Soke Hausel was certified by Zen Kokusai Soke Budo Bugei Renmei in 1999. After working through the ranks in Shorin-Ryu Karate and Kobudo.Soke teaches his students traditional Okinawan martial arts including martial arts history, philosophy and some Japanese. 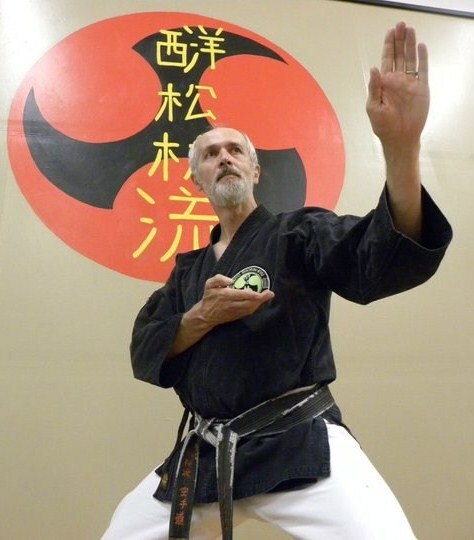 Certified in two dozen martial arts gives him a unique perspective on the martial arts and in 2014, Soke Hausel will celebrate five decades of martial arts experience. His greatest achievements are his students who are now scattered worldwide and include a very large percentage of PhDs, engineers, scientists, social scientists and teachers. Phoenix, AZ, July 2nd, 2013: A group of traditional Shorin-Ryu martial artists from Arizona and Wyoming traveled to the Juko Kai National clinic in New Braunfels, Texas June 15th to train in an incredible art known as Combat Ki – a martial art of extreme body hardening that allows JKI martial artists to accept full-force strikes to vital parts of the body with little effect. The art, created by Dai-Soke Sacharnoski in 1960, is so advanced it has been featured on several programs in recent years including Stan Lee’s Superhumans, Sports Science, Discovery Channel and others. While at the clinic, the group also trained in an Okinawan martial art known as Okinawan Kempo and Tode taught by Dai Soke Sacharnoski). At the close of the clinic, martial artists from around North America including those from Arizona and Wyoming tested for Menkyo Okuden (entrance to secrets), a combat martial art rank essentially equivalent to 1st dan black belt. Those from Gillette Wyoming who successfully passed the exam included Kyle Gewecke (4th dan), Chase Cassidy (1st dan), Brandon Brown (3rd kyu) and Nick Jarvis (4th kyu). The Arizona Martial Artists included Neal Adam (6th dan), Victoria Davis (1st dan), and Ryan Nemec (4th kyu). Awards were also presented to two outstanding martial artists from Arizona. Ryan Nemec was awarded “Outstanding male martial arts student of the year”, an award presented by the JKI Hombu for students who have shown exceptional dedication in the martial arts. Soke Hausel was awarded the title of ‘Meijin Wa Jutsu’ for lifelong contributions to martial arts as an instructor. Only a few martial artists have been presented this title which translates as “master of masters” or “martial arts genius”. In 2012, Soke Hausel of Mesa-Gilbert, Arizona was also awarded rank of junidan (12th dan) and became one of a handful of to be awarded this rank since the 18th century. Grandmaster Hausel began training in martial arts 49 years ago and taught at four major universities prior to opening the Arizona Hombu (world headquarters) in Mesa in 2006. The Arizona Hombu in Mesa, welcomed several yudansha (black belt rank) and sempai (senior brown belts) from the Utah Shorin-Kai located in Murray, Utah to train in advanced martial arts techniques and hanbo on May 3rd and May 4th. The group arrived at Phoenix Sky Harbor from Salt Lake International airport on Friday morning and checked into their motel in Chandler near the Arizona martial arts training center on the border of Gilbert and Mesa near Baseline and MacDonald. On Friday evening, the group led by Kyoshi Rob Watson, 8th dan, arrived at the martial arts facility and exchanged hugs, handshakes and greetings with members of the Arizona School of Traditional Karate and Soke Hausel, grandmaster of Seiyo Shorin-Ryu. Following greetings, the martial artists bowed in, warmed up, and began training with hanbo. The hanbo is a 3-foot bo (stick) often seen in the hands of ninja or jujutsuka training in the arts of ninjutsu, ninpo, and jujutsu. Soke Hausel was introduced to this unusual, but very practical art by Dai-Soke Sacharnoski and trained in Togakure-Ryu earning certifications through Hatsumi Masaaki, Soke. Weapons similar to the hanbo include tonfa, nitanbo and kioga. The kioga, also referred to as kibo, is a common tool of law enforcement that is referred to as ASP or expandable baton. The difference between the use of the hanbo and kioga is that the hanbo is always the same length, but many techniques are the same. The difference between training between law enforcement officials and martial artists is that law enforcement training is limited in the use of this tool. Martial artists never end training with the tool and use it to activate pressure points and train to use it with blocks, strikes, restraints and throws. Following two hours of training with the hanbo, the group retired until the next morning. On Saturday morning, training began in advanced empty hand (karate) techniques. These included blocks, strikes, chokes, throws and restraints. The group trained for five hours before the clinic ended. At the end of the clinic, Kyoshi Rob Watson, 8th dan and Renshi Todd Stoneking, 6th dan, presented gifts to Soke Hausel. Members of Arizona and Utah said their goodbyes and it was the consensus that time went by too fast. Soke Hausel will travel to Utah in the fall for the Utah gassuku (adverse training) at the East Canyon resort near Park City. Professional photographs at the Hombu clinic were provided by NemecPhotos. We are very thankful and appreciated by the excellent quality of the photography at this year’s clinic.